This page will provide viewers with answers to frequently asked questions and some problem/product match-ups. DISCLAIMER: This company accepts no responsibility for any actions undertaken by readers as a result of content acquired from this page or website. How do I find the leak? My husband and I are encountering a major problem in our basement that has just recently started to occur. We have always had some water during the spring thaw in unfinished areas of our basement but it wasn't really a problem because you knew where it was and could easily vacuum it up. However, this spring (and I know we have had a lot of snow, rain, etc.) we developed water in the middle of our finished rec-room. It actually came up through the wood sub-floor and we noticed it when the carpet laid on top of the sub-floor got very wet. There is probably an inch clearance between the concrete floor and the surface of the wood. This greatly concerns me as we could develop mould and this could cause more health problems for us. Because the basement is finished, we have no idea where the water is coming in. We are both retired and the expense of total excavation of our property is financially out of the question. We have a driveway on one side and a concrete pad at the rear - to have these areas excavated would be very difficult and expensive. Sorry you are having troubles. In order to fix the problem for the least amount of money possible you must find the true source of the leak. The efforts you put out to find this will pay off. That may mean cutting dry wall etc. When you cut dry wall you only need to make inspection holes at the bottom of the walls in order to feel the wall bottom and see if there is evidence of leakage, don’t stop until you find it. Your mind set should be that drywall and painting work is cheap and can be done by you or a friend. ( Drywall guys are usually cheap) Commit to finding the leak(s). There will be leakage at one spot that corresponds to each flaw. We call this “Specific Leakage”. 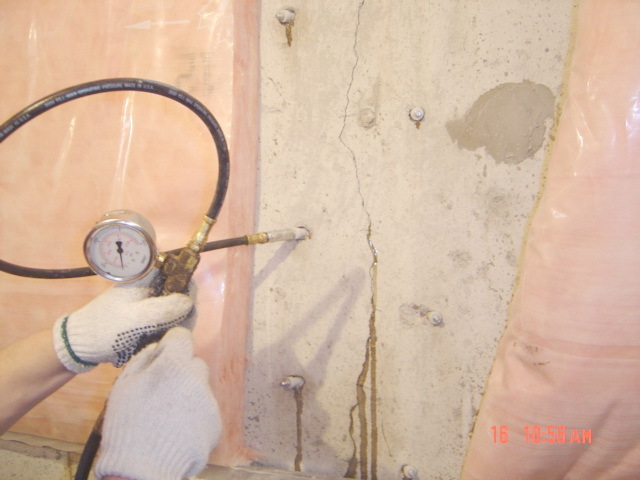 This leak can be from a crack, rusted form tie, improperly sealed basement crack injection with polyurethane grout, form tie hole, honeycomb in the concrete, cold joints between concrete pours, or leaking window/door frames. Leakage can also come from snow being piled up against the house. This occurs when the weeping tile is no longer removing water fast enough. A faulty pump can also cause a backup of water that will come up the through the floor and at the floor wall joints. The bottom couple of blocks will likely be full of water. If you drill a hole in one, you may get more water than you bargained for. A couple of tips would be to examine the wall closely from the exterior to find all cracks. This will help you locate them on the inside. Pipes coming through the wall are other points to look for leakage. Block structures have problems at the corners with breakage particularly near downspouts. Frost pressure will break a block wall horizontally at one to three blocks or more below the grade line. These are breaks hard to find in a covered wall and should be checked for by visual inspections. When a wall breaks, it will deflect inwards. This causes the crack to be wider on the inside of the basement than the outside making it quite hard to follow when digging outside (chasing the crack). Once you have found the leak, you can then determine the method of repair. Q) Your company is claiming that you can rectify this problem without digging up around the foundation of the house and I am wondering how I would go about getting an estimate to have our problem corrected. A) Most of our clients will be able to describe the nature of the leakage problem over the phone of in email messages and supply us with good digital pictures of the project. With this information we can provide a quote that is conditional on our site visit. 95% of our clients have the work completed without any modifications to the proposal. Changes are needed if details in the job have been overlooked. We are able to pass these savings on to our clients and provide a very efficient service. Q) My husband has been fixing the same crack for the last 5 years and it still leaks. Can you help us? A) Yes. If your problem is with a crack in a poured concrete wall and you want to fix it yourself, you will need to excavate. Dig all the way to the footing and expose the bare wall at least 12" on either side the crack. Clean the wall to virgin concrete, remove all existing tar etc. 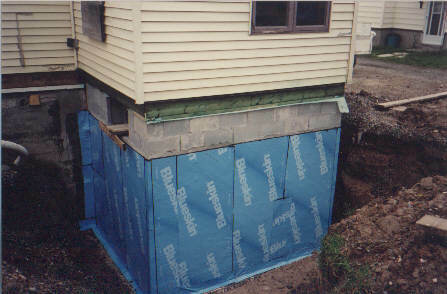 Use this membrane to cover the crack according to their specific installation instructions. Blueskin WP "Crack Kit". We can provide polyurethane crack injection to seal this leak from the inside if you don't want to do it yourself. Note, you must use a flexible seal to repair this leak. Polyurethane injection permanently fixes the leak after years of repeated patching attempts. Q) I have a number of cracks in my poured concrete foundation and I can't excavate to expose them. What is the best fix for this? A) The number one choice is polyurethane Injection performed from the inside. No digging required. Q) Can I get "water problem" work done in winter, or do I need to wait until spring? A) The only restriction on getting basement leaks fixed is if you opt for an exterior repair. We offer repairs for virtually all problems that can be performed year round from the inside of the home. see: Interior Water Control Systems, Between Floor Drainage Systems, Polyurethane Injection. Q) Can I use caulking from inside to stop a crack from leaking? Q) My basement only leaks in the spring, how can I fix that without spending a fortune? A) No measures should be undertaken until you know why it is leaking. Check first to see if you have eaves troughing, downspouts, and a transport system to move the roof water at least 10 feet from your foundation. In the spring, all the snow from your roof (average 1800 cu. ft.) melts, the resulting water is deposited right next to your basement wall. Because the ground next to the wall is usually thawed out, approximately 6" wide, the water drains in the worst place possible. Secondly, make sure the landscaping slopes away from the building and allows for unimpeded runoff. These simple improvements can stop or significantly reduce existing and future leaks. If this does not fix your problem then you need to call me for a more complete inspection ($150). There could be a wide variety of reason why you have a leak. Don't let someone push you into a contract to "fix" the problem when you don't know the cause. FACT: Over 50% of the clients who call me for an estimate have been quoted by most other contractors to have a $8,000 to $15,000 weeping tile job done, when we permanently repaired the leak or break for $500 to $5000. Q) My basement has leaked for years where the floor meets the wall, do I need to have it dug up and the weeping tile changed? A) Although this kind of leak is almost always due to a reduction or blockage of the existing weeping tile system, our Interior systems can permanently control this problem. FACT: We have never had a call-back on these systems. Q) My block foundation is cracked, water gets in during heavy thunder storms. I've dug it up and applied tar and plastic to the wall but it doesn't seem to work, what is the best and most cost effective way of fixing my problem? Can I do this myself? A) Specifically, you have two problems. The first one is structural in nature and second is the water problem. You should always fix the structural problem first. Carbon fibre reinforcing under the guidance of a structural engineer can remedy most of these problems. Once the wall has been structurally repaired you can now address the water problem. Unfortunately carbon fibre systems are not sold as a water stop repair. Depending on a wide variety of factors you can choose from many systems and products. see Interior Membrane Systems, Interior Water Control Systems, and exterior Waterproofing Membranes. Some of these you can do on your own. Q) I just purchased a house and the previous owner swears that they never had a water problem. Last week I found water on the basement floor. How can I tell if the problem was there before? A) First thing you need to do is identify why the basement is leaking. Once you have determined that, you can see if any measures have been undertaken to stop or divert water. Things to look for are efflorescence (white chalky substance or what may look like white mould), caulking on the inside of the wall, hydraulic cement at the floor / wall joint, mini dams, drill holes, or diversion channels in the floor. Also present may be black mould, old wood rot, rusted nails, water stains, lifted paint, soft drywall, mushrooms, earthworms, pill bugs, silverfish. Once you have found some good evidence, take some good pictures and contact your lawyer. Proceed according to his or her advice. The cost of the repair may range from $250 to $6500 or more, follow the proper channels as soon as the problem presents itself. 99% of inspections we have performed for real estate transactions and legal issues rarely culminate in a sale for us, to date this has cost us over $30,000 in wages that only serve to increase the costs to customers looking to hire a professional to actually fix their problem. This is why we charge a fee for this service and provide a detailed report for your actions. Clients who are looking for an estimate on viable repairs or products and intend on getting the work done eventually will not be charged for the estimate. Q) I heard that a leaky basement can be fixed from the inside. Is this fix as good as doing it from the outside? How much would that cost compared to digging? A) Our Exclusive Interior Water Control System is installed when the existing weeping tile system is no longer functioning. This can be determined by observing leakage at the floor wall joint. In our opinion this installation is superior to redoing the weeping tiles. Our interior systems are custom constructed to suit a wide variety of on site complications to assure a 100% success in solving the leak problem. These companies share information and develop procedures which is all designed to ensure a satisfied client. This system will solve your leakage problem. FACT: We have installed about 2,000 of these systems and had zero call-backs on these. The most effective of the interior drainage systems is a perforated drain pipe installed inside the perimeter of the footing. Q) Can I install this system myself? A) At this time we only sell this system with installation provided by our trained crew? There is a reason we get zero call backs and we don't want to have a flawed installation ruin this systems reputation. However, you can hire us as consultants to provide you with detailed instructions on your own installation. Be prepared for plenty of sweating, this job requires lots of muscles. Q) What if the basement is finished with studs, insulation, and drywall? A) Roughly 35% of our clients who have purchased an Interior Water Control System have had "finished" basements. Every one of them paid less and had the complete project installed in half the time than they would have if the job was done by traditional excavation methods. One installation was performed in January in a basement recently finished by an interior designer. Our client was happy with the results on completion. Remember, the exterior of most homes are also "finished". Shrubs, flowerbeds, decks and walkways would all have to be removed and replaced, adding to the cost. Q) Does the interior method produce a lot of dust? A) All interior work comes with some dust, but we are very good at controlling it. Big fans are installed in basement windows to draw air from upstairs, into the basement then out of the house. Our own carpets are laid out over the floor so we don't get yours dirty. Plastic is utilized to cover belongings and direct air flow. Q) Is this operation noisy? A) Yes, we use jack hammers, leave the house and remove your pets for the first 4-5 hours. Q) I think the reason my basement leaks is that we have a high water table! Can this occur? A) Yes, but it is very unlikely. I have been in literally hundreds of basements with water problems and I have only seen it twice. Q) How much can eaves troughing really help a leaky basement? A) Heaps, if you don't have it, get it. Q) Does landscaping play a roll in basement leaks? A) Yes. Make sure the landscaping takes water away from your building. You can incorporate Yard Drains to effectively remove water or transport it from low spots. Q) I have already dug next to my poured concrete foundation and found a crack. This crack couldn't be seen from the inside because of the studs and drywall. It starts at the top of the wall and continues all the way to the footing. I know water enters the basement here or will enter eventually. What can I use to seal this crack myself? Basement waterproofing with Peel and Stick membrane. A) Your best choice would be Blueskin WP. Your preparation will dictate your success. 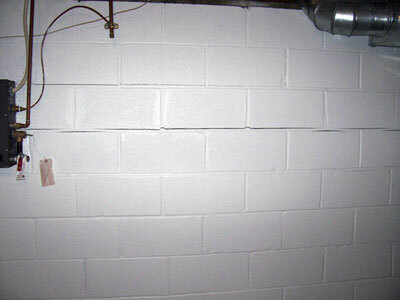 Q) Why do "block" basement walls crack or shift ( I'm speaking mainly of bowed walls here)? A) There are as many theories on this subject as there are cracked basements. Here's mine; I have witnessed cracked and bowed (pushed in) walls with clay backfill, perfect granular, sand, boulders buried next to the wall, construction debris next to the wall, and every other type of backfill. I have listened to owners tell me of the sub-zero night they were watching the game on TV when the entire house shuddered as an entire basement wall moved instantly by 3/4 of an inch. Based on all the data I have uncovered, I believe that a combination of light snow cover, a very wet January thaw then a quick prolonged deep freeze, are to blame for the vast majority of broken basements in Northern Ontario. 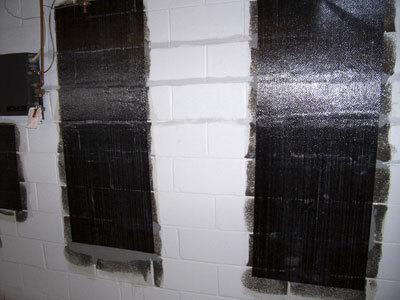 Carbon Fibre reinforcing can be effectively used to address the structural cracking, An Interior Drainage System to address the leakage through and into the block walls, or an exterior peel and stick waterproofing membrane system. You may also opt to replace the entire wall if you have lots of money. Q) I have five quotes to fix a leak in my basement, all of them say I need a complete excavation around my house and a full weeping tile replacement to solve the problem. You tell me I don't, what gives? A) Let me answer this with another question and you be the judge. If I only sold one or two types of repairs, and didn't have the will or resources to find new and better technologies for my clients, what would I sell my clients? We believe in fixing the problem with intelligent methods. After all, it's your money, who do you want to trust with it. Fact is, one of our clients actually was quoted by five other contractors who had her convinced that her leakage problems were due to failed weeping tiles. All of the quotes ranged between $8,000 to $10,000. We fixed her problem using a waterproofing membrane on her porch (above the ground level). Her problem has been solved for over two years. $550.00. Q) What should I look for in a contractor if I don't use you guys? A) In a small company, the attitude of the owner is the company! If you get a creepy feeling upon your initial interview with him or her, trust your instincts. Get 3 to 5 references and check them out. they record complaints against companies by upset consumers. WSIB (formerly WCB) coverage is a must. Get prove they are up to date on there payments or or you could be responsible for injured workers. Talk to their suppliers, do they pay their bills, if not, you may be sued or have liens applied against your home for outstanding product accounts or employee payrolls not paid by your contractor that where used on your project. Check with the Ministry of the Attorney General (Small Claims Court) to see if they have been involved in litigation. Make sure you qualify the results of this search, many times the problems resulting in court action are a result of the home owner not understanding what they are purchasing. Protect Yourself...Its your money, you have a choice! Q) Our garage floor has begun to flake or spald. What can I do to fix this problem? Q) We have a room under our garage. Water leaks through cracks in the floor and into the room. What can be done here? A) Either caulk the cracks with polyurethane caulking following strict placement methods or caulk and then coat with the Polyurethane Deck Coating. If the damage to the structure has already been done, it may fail even after a so called "repair". 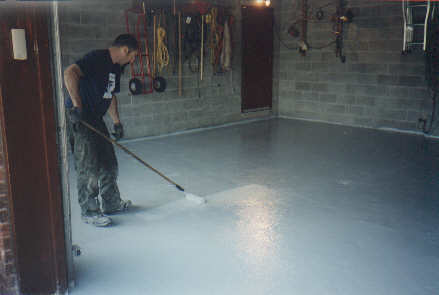 Q) Do you install new concrete floors in basements and garages? A) Yes, but we do not pursue this type of work. Mostly with the Between Slab Drainage Systems. Q) My garage floor, (slab on grade) has a crack. Why is it cracked and what should be done about it? A) The crack is likely due to shrinkage, yes even concrete has this problem. On its own it is not a problem, however you can close it up with a high quality polyurethane caulking. Q) Do you seal concrete? Q) Our basement floor is always dusting. What will fix this problem? A) A variety of reasons cause floors to dust. Our sealers may stop this problem. Q) What can I use to waterproof my front porch? A) A good elastomeric coating. There are some pretty good systems currently on the market. Q) I painted the basement floor but even though the floor seems dry, the paint keeps coming off. Why? Can you offer a solution? A) Try this. Tape a 4'X4' piece of plastic to the floor. If you see moisture under the plastic after 24 hours, you have a vapour transmission problem. It is likely there is no vapour barrier under the concrete to prevent it from moving right through the slab. A method of "repair" is the installation of the DriCore™ sub-floor system. You can also try Permaquik or xypex type materials, but if you already painted the floor, these materials won't work. Q) My floor was poured too low and as a result it sits next to the footing. I constantly get moisture and leaks coming up through the floor and the joint between the two. What is your solution? A) It may be that the only solution that will work is the Between Slab Drainage System. The exterior weeping tile is at the same elevation on the other side of the footing. Water finds an equal elevation inside and outside, eventually, unless measures are taken to control it. By installing this system, you provide the drainage that should have been there when it was first constructed. As an added benefit your new floor will be level, bone dry, and warm due to the thermal break afforded by the Air Gap Membrane. Q) Moisture comes through my walls and I'm sure its not condensation. What have you got that I can install myself? A) The Interior Wall Membrane System. Make sure you drain it into something. Remember, you cannot seal a block wall from the inside. The wall cavities will fill up with water and find the next easiest spot to leak through. All interior systems work on the principle of water control. Q) A rock is intruding into our basement and with the rock we get water leaks. A contractor told me that we will need to dig up and seal the leak from the outside. Can this be done to guarantee a dry basement? A) Not by digging it up. Cracks in the rock may prevent a permanent exterior fix and water can run right under a weeping tile pipe. A permanent fix can be undertaken from the inside using Interior Air Gap Membranes and a covering of protective concrete. We have installed several of these with 100% success. Q) How do you remove paint from the outside perimeter (parge coat) of the basement? A) Use of an environmentally friendly method of paint removal. A high pressure jet (3800psi) of water and sand strips every piece of paint and loose parge off the wall. We lay out filter cloth to catch the paint and sand so we can dispose of it properly. Once this is done, re-parging the foundation is the next step. If you grind it off you'll make lots of dust so your neighbours will love you even more. Q) Do you do parging? Our lovely client observing the parging work. A) Yes, but we no longer offer this service. Q) Should parging be done over metal lathe (screen)? A) In most cases we always bond our parge coat to the wall without the use of metal lathe, if we end up using it, we never use un-galvanized concrete nails to fasten it...they will rust and show through. Q) What is the best method of fastening things to concrete? A) Drill a 6mm dia. hole then slip in a Wak-It by UCAN™. It's a nylon sleeve with a rust proof screw. Hammer in the screw. If you need to remove it, unscrew the screw. Hilti shots can fracture the concrete so we rarely use them. Q) Water comes up through cracks in my basement floor! What is the least costly method of repair? A) First try to install a perforated sump system with a filter. This will create a low spot under the floor which will be the easiest place for water to go. Each sump has a specific zone of influence over water collection. Placement is the key to success here. Remember, you can't stop the water...you can only control it. Q) I need a new sump pump, can you suggest one? A) Yes. Choose ones that don't have float switches that can get stuck. Try to select ones with a diaphragm switch. Buying the cheapest pump may cost you huge if it fails. Q) What level should the water be in my sump pit? A) Never higher than 12" from the top of the concrete floor and always below the level of the exterior weeping tile if possible. Simply put, you should aim to create a dry zone below the underside of the floor slab. Q) How can I know my pump stopped working before my basement floods? A) Purchase and install a High Water Alarm. When the water touches the electrical contacts, an alarm sounds. This does provide some measure of protection but doesn't help you if no one is there to hear it. Q) Should we get a battery back-up system for our sump? A) Yes. Unless you like to gamble.